Do you bore yourself with your lack of ‘pre-dinner nibble’ imagination when you have guests over? 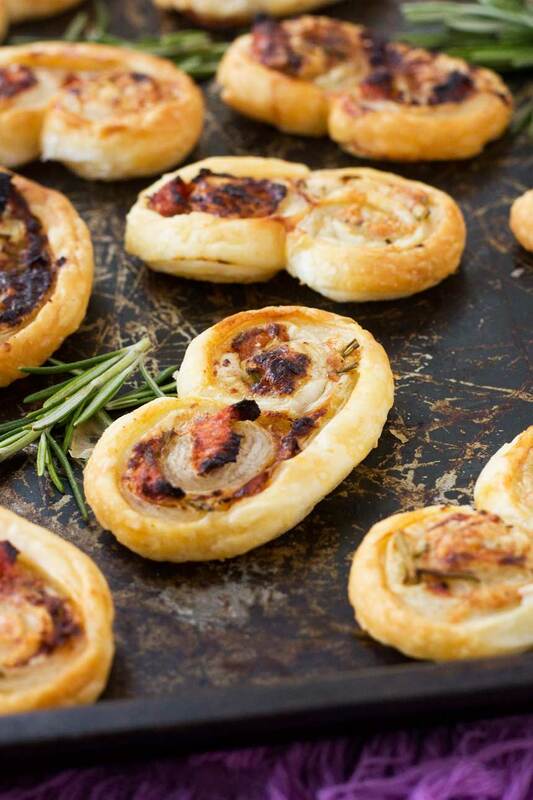 I certainly do, so I thought I’d replace those dull dishes of crisps & nuts with something a bit more impressive … these easy puff pastry ‘palmiers’ stuffed with tasty sun-dried tomatoes, parmesan & fresh rosemary. Mmmm! One of the things I thought that the Australians were really good at when I lived there recently was chips ‘n’ dips and ‘nibbles’ before dinner. They love ‘em and have all sorts of different kinds like little rice crackers, different kinds of fancy breadsticks, pots of stuffed olives and loads of interesting hummus-type dips. It’s really hard not to eat a few too many and end up spoiling your appetite! Over here in the UK we’re pretty boring about this kind of thing and you won’t usually get more than a few crisps or maybe if you’re extra lucky some mixed salted nuts. If that sounds a bit rude of me to say so, then let me assure you that I’m no better myself. I will usually just plonk down dishes of said crisps or nuts to have with drinks before dinner if I have guests over. The shame! 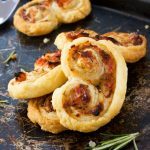 Whatever the reason, I thought these cute little savoury puff pastry palmiers would be perfect for spicing up my pre-dinner offerings at my next dinner party! 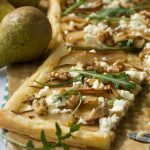 And the great thing about them is that they not only take mere minutes to put together, as you use a whole sheet of ready-rolled puff pastry, but you can make them, put them on a baking sheet, then pop them in the fridge until your guests arrive. When you hear the door-bell ring, you can pop them in the oven and hey presto, 10 minutes later you’ve got warm, cheesy, tomato-y little fresh pastries for your guests to nibble on until dinner’s ready. 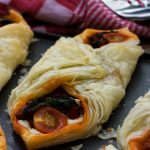 These are nothing more complicated than two or three ingredients sprinkled generously over puff pastry and then rolled up tightly from both of the long sides so that they meet in the middle. You end up with a long roll of pastry that you then slice, like a sausage, in about 1cm-thick rounds. Pop on a baking tray, brush with a little egg, then bake. Silly me fully intended to take a picture of the long roll before I cut it into rounds, but totally forgot in my excitement to get them into the oven. Sorry! (when I make them again I’ll take a photo and pop back here and post it!) Hopefully though the recipe explains clearly enough how to do the rolling in part. It isn’t complicated to understand – promise! Roll both of the long sides of the pastry in until they meet in the middle. Pop in the fridge to firm up, then slice into 1cm-wide slices and bake! Although I chose to make sun-dried tomato, parmesan & rosemary palmiers this time, you could of course choose other flavours. And really the possibilities are endless. How about olives, oregano & feta? Or bacon, thyme & cheddar? Pesto & prosciutto? I could go on and on! Hmm, any tips before I leave you with the recipe? Let’s see … oh yes, pop the rolled-up pastry roll in the fridge for half an hour so that it’s easier to slice through. And of course you can freeze any uncooked palmiers until you want to eat them. Just carefully place them in containers with the layers separated by baking paper and then cook straight from frozen when you want fresh palmiers – just give them a few extra minutes in the oven. So I guess this means goodbye oh-so-boring pre-dinner crisps … hello much-more-interesting palmiers. What lucky guests you’ll all have at your next dinner party! 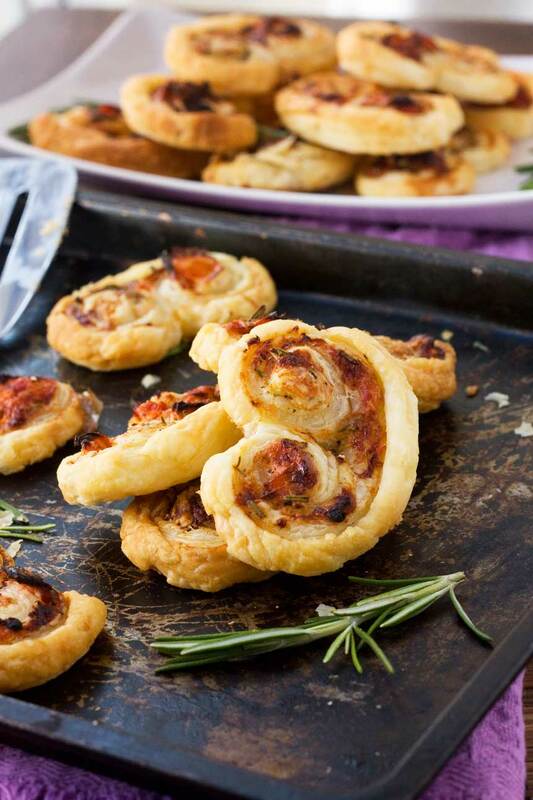 Say goodbye to boring 'crisps & nuts' nibbles when you next have guests over and hello to these tasty puff pastry palmiers stuffed with sun-dried tomatoes, parmesan & fresh rosemary! Lay the pastry out on a well-floured board, then sprinkle evenly with the tomatoes, parmesan, rosemary & plenty of pepper. Carefully roll up both of the long sides of the pastry until they meet in the middle. Brush the area between the two parts of the roll with a little egg and push the two parts together so that they stick. Pop the whole roll into the fridge for at least half an hour (either pop it in on the board or if it won’t fit in the fridge carefully side onto something smaller like a baking tray.) Meanwhile, heat the oven to 200C/390F. Remove from the fridge and slice into roughly 1cm-slices with a big sharp knife. Carefully place the slices on a baking tray lined with non-stick baking paper. Reshape them a little if necessary, then brush the tops with the egg. Bake for 10 to 15 minutes until the palmiers are puffed and golden. Cool slightly on the tray, then serve while still warm! It doesn’t really matter if your sheet of pastry is a little smaller or larger. Just adjust the amount of toppings you add accordingly. Wow, I love this savory version of palmiers! They look absolutely fabulous! Thank you, Marissa! I must admit I was quite pleased with myself for ‘discovering’ these. Glad you like them! That is very true! Aussies LOVE their nibbles and wine 🙂 I love the flavours you have going on in this!! I make palmiers all the time. I have all the ingredients for this, I might made it this arvo! Yee ha! I love these and the flavor combinations sound delicious. I have to give these a try. Thank you, Janette … I hope you do give them a go some time! I actually prefer predinner nibbles to the main course, especially these. They’re all of my favorite flavors in one place. Love it! This is the first time I’ve tried savoury ones, too, Oana. Do try them some time … they’re sooo easy to make but really tasty! Thank you, Medha! Really happy you like them! These palmiers look delicious, Helen! I actually just saw a recipe the other day for a sweet kind, so I’m loving that these are savory. Perfect! Thank you, Gayle! I really hope you try some savoury ones some time. They go so well with pre-dinner drinkies! Omg this is genius!!! 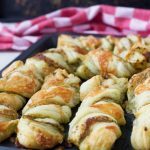 I’ve never tried savory palmiers but these definitely look worth a try! To be honest, I would give you extra flavor combinations suggestions if I had any – but I really am too busy focusing on these GORGEOUS palmiers that you’re sharing right here, right now. Absolutely love this as a pre-dinner bite – totally saving it for future use, thanks so much for sharing! Hope you’re having a wonderful Sunday! Hi, Ala! I’m really happy to have give you an idea you might be able to use in the future. They’re so easy you don’t even really need the recipe. Really glad you like them! Tu sais bien que à cette saison J’adore prendre l’apéro dehors. Ta recette est parfaite pour ça. J’imagine déjà déguster ces petites palmiers avec un bon verre du blanc ! Such an amazing appetizer Helen! So easy to make, too! Love these palmies! Not sure if I want to serve them to my guests, I can eat them all 🙂 🙂 🙂 Pinned! Oh my gosh! These look beautiful! Perf for a pretty, tasty little meal! Guests would love these! Great recipe! Thanks for sharing!! 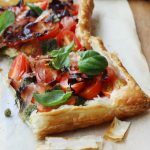 I once tried working with stuffed puff pastry – before I had a chance to chill it – needless to say it was a total disaster! Quite the opposite of these gorgeous Palmiers, Helen! Oh no, Shashi! Well I promise you these are sooo easy to make. I really hope you risk making these some time. I think they would turn out just fine! Thank you so much for being so enthusiastic about these, Kathleen! They would indeed go well with a glass of wine … why didn’t I think of that?! A savory palmier is such a great idea, Helen, and I love the ingredients you used! These would be such a special side dish to serve, and your photos are so pretty! Pinned. Oh how yummy! What a great way to use puff pastry sheets. Thank you so much, Tina! I must say these taste pretty good for how easy they are to make. Glad you like them and thanks for passing by! This is my kind of party food. I am also kind of obsessed with sun dried tomatoes at the moment. I have been eating them out of the jar. Ooops. Haha … well, I can think of worse things to be eating out of a jar, Dannii! Glad you like the palmiers! Hello! Oh, that’s wonderful that you have a rosemary bush in your garden. That’s one of my ambitions – to have a whole herb garden! Thanks so much for passing by! Palmiers are actually one of my favorite fun savory appetizers! 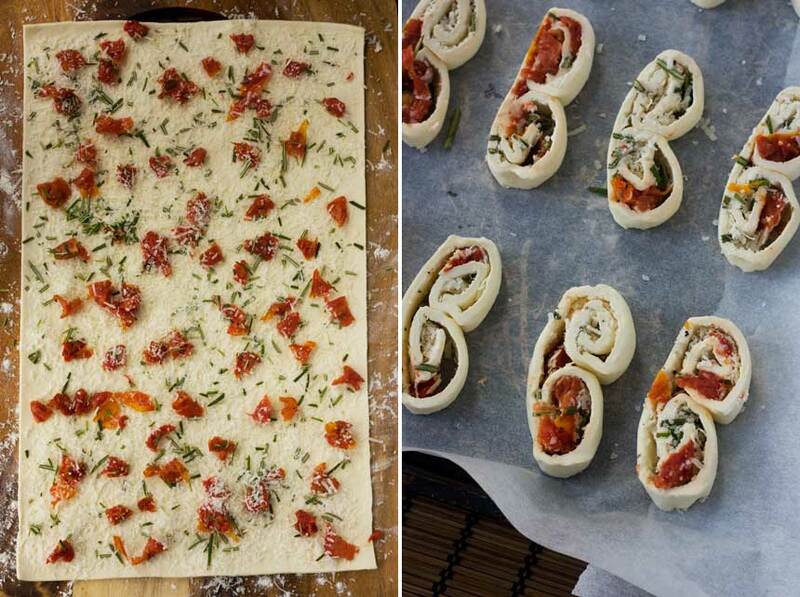 I’ve made them with pesto before, but love this sun-dried tomato parm twist! I’m going to try pesto ones next time, Joanne. There’s so much flavour there already – you probably don’t need to add anything else. Glad you like this version, though! I can just imagine how nice and buttery these are with that puff pastry! They sound just wonderful – especially with the fresh rosemary – my favorite! Thank you, Ashley. These are especially lovely and buttery fresh from the oven … mmmm! Love the flavors here Helen! What a creative twist on the classic! They look simple as can be yet so special. I love my nibbles before dinner too!! I usually love them so much that I eat way too many of them and then I’m not hungry for dinner, haha! But it is totally worth it because little appetizers like this are so good! 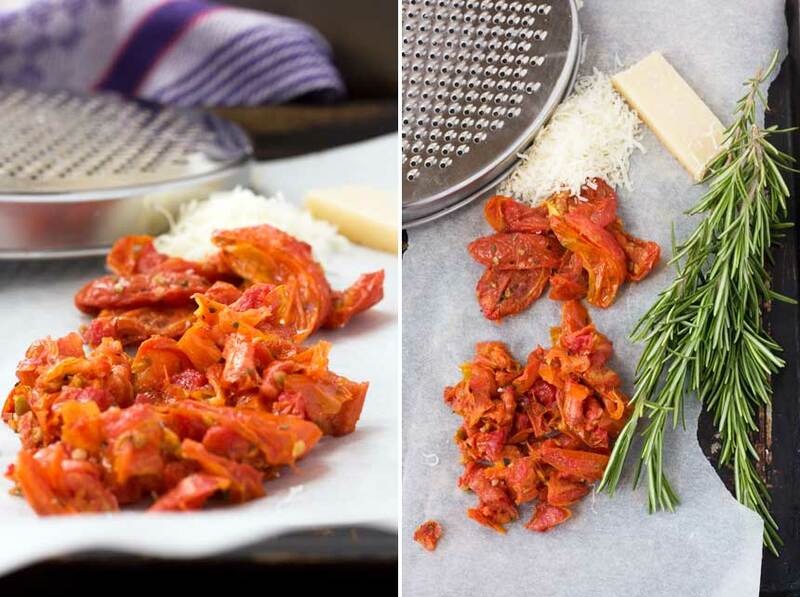 I was just cooking with sun-dried tomatoes this week and they have such a great taste! These look awesome, Helen! I’ve never had or made palmiers before but they look amazing! They would be a wonderful appetizer! Oooh, do try them some time, Kelley. They’re such a nice little simple thing to master!